When he called the people unto Him with His disciples also, He said to them, Whosoever will come after me, let him deny himself, and take up his cross, and follow me. For whosoever will save his life shall lose it; but whosoever shall lose his life for My sake and the gospel’s, the same shall save it. 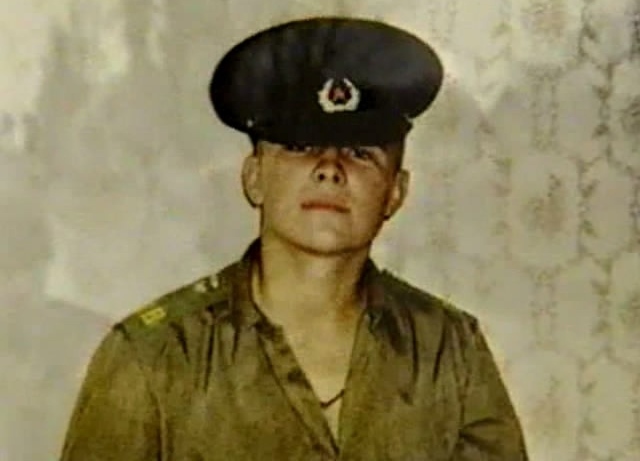 On May 23rd, 1996, his 19th birthday, Private Evgeny Rodionov hung from the wrists in a dark and filth-ridden cell outside of a village called Bamut. The young man could hardly have imagined such ill fortune just a year earlier upon his induction into Russia’s armed forces. A native of the Moscow region, Rodionov joined the border troops and was sent to the North Caucasus for duty at an outpost near mutinous Chechnya. With three comrades he manned a checkpoint along a desolate smuggling road on February 13th; as if to illustrate the outrageous negligence of the Yeltsin-era Russian military, they were not provided rifles or even radios. And so within a matter of hours these teenage conscripts, raw youth on alien and hostile terrain, were captured by a dozen well-armed Chechen fighters riding in a commandeered ambulance. Despite hearing screams for help, officers nearby simply wrote their men off as deserters. Rodionov and his comrades would then spend three months in confinement, undergoing 100 days of torture, beatings and starvation. Kidnapping to extract payment was both time-honored custom and a burgeoning cottage industry in North Caucasus republics like Dagestan, Ingushetia and Chechnya. In the 1990s Chechen gangsters and rebels could obtain well-publicized million-dollar sums for businessmen, journalists and government officials. Yet ordinary Russian soldiers, prisoners of war rotting in dungeons or forced into slavery, were considered to be almost worthless by both sides. An 18-year-old private might just as likely be shot and cast into a ditch as ransomed. Aside from their mothers, no one evinced concern for the fate of such men; they were the cannon fodder of a criminally inept and venal ruling class in Moscow. And like other mothers, Liubov Rodionova would travel to the Caucasus, braving the chaos and war of Chechnya in an attempt to rescue her child. When she approached Private Rodionov’s superiors, they showed little interest in the matter, and “human rights” activists informed her that as a Russian soldier, her son was a killer of innocent civilians. She nonetheless had come within mere miles of Evgeny at the time of his death on May 23rd. On this day Rodionov would seal his destiny. A bid to escape had proven futile, and he now stood between two paths. His captor, Chechen field commander Ruslan Khaikhoroyev, was willing to concede him his life. All that was required of Evgeny was to renounce his baptismal faith and join the ranks of the Muslim fighters. If he would abandon Jesus Christ and swear allegiance to Allah, freedom was his. Among the mountaineers there was a chance for survival, refuge and perhaps one day a wife and progeny. A handful of prisoners had taken up these offers before; they could be seen in rebel propaganda videos- fair-haired Slavs among darker Caucasians, all brandishing weapons and chanting the Islamic war-cry. If Zhenya would only remove the small silver cross from his neck and submit, new possibilities would open to him- brotherly acceptance, women and even martial distinction against his own kinsmen. Should he refuse, the Chechens would slaughter him like a ram at one of their feasts. Dear God, what shall I do and how shall I? Rather than the kingdom of this world. Serbia’s great prince chose salvation over the world not merely for himself, but on behalf of his countrymen. With this decision must have come an almost unbearable agony, as the Serbian nation would be conquered and enslaved under the Turkish yoke for 500 years. Why would God allow these evils to be wrought against His people, and how could He ever bring renewal to them after such darkness and devastation? At Kosovo Field the tsar and his valiant knights would ride to their doom, and the Serbs would be subjected to an age of Ottoman tyranny. But through this privation they stood fast in their faith to attain interior freedom, the spiritual quality that ennobles a race. And then they would rise again, as “a nation’s destiny, its preservation or its fall, is decided according to the spirit within its people”. Rodionov defied his executioner and faced death with humility and an iron will, bearing his cross unto the very end. A son of Russia, he would not tread the path of the coward, and never would he bow before the god of Mahomet. Over the course of an hour that May 23rd, the butcher Khaikhoroyev decapitated Zhenya with a rusted saw, and then murdered his three comrades Andrei, Igor and Aleksandr. Even in our era of hegemonic usury, global automated war and electronic seduction, heroes fight and perish in blood-testimony to restore their people. Through struggle they are sanctified. For love of Christ the heavenly Tsar, Zhenya Rodionov suffered and died; for loyalty to his heavenly fatherland, he would be rewarded the red crown of martyrdom. May we be graced with the strength to share in his immortal victory. Glory to the soldier-saints named and unknown; glory to the martyrs ever faithful and true. Abductions are a recognized national pastime, but only practiced outside one’s clan (teip). To do otherwise would be to risk endless blood-feud within the clans. Then-assistant prosecutor of the town Malgobek, Ingushetia, Magomed Evloev, had met and spoken with Khaikhoroyev in the middle 1990s. Khaikhoroyev’s group had already kidnapped and killed three geologists in 1995. Evloev called the zone under this bandit leader’s command a “total hell”. Andrei Trusov was also beheaded, while Igor Yakovlev and Aleksandr Zheleznov were shot. Khaikhoroyev first ransomed the location of Rodionov’s body to his mother. He then charged her another fee in order to recover her son’s head, buried elsewhere. In addition to the Koran’s Sura 8:12 (“I will instill terror in the hearts of the unbelievers, smite ye above their necks”), Chechens have long harbored the superstition that if a man beheads his enemy, the victim cannot return from the afterlife to haunt him. May God Bless the family and may the man up decided his fate have the demons that possess him leave and find repentance in God Almighty. Evgeny the soldier, pray unto God for us. Glory to Him Who gave thee victory in thy terrible contest, O holy Martyr! Pray now for us unto Christ God, that our souls may be saved. The Serbs are a remarkable people with unshakeable faith. Hail to the Martyrs. Hail to the martyrs! I keep a special place in my heart for the martyrs of Romania who dies fighting the Communists in Spain, Ion Mota and Vasile Marin. Holy newmartyr Evgeny, pray for us sinners.